Magic’s summer of sentimentality is at a close. A brand new set is nearly in our hands. Soon we will explore the world of Ravnica in a way we have only done a couple of times in the past. Before we indulge in the guilty pleasure of Guilds of Ravnica, let’s think about Magic’s awesome twenty-fifth anniversary one more time by pitting Magic’s most recent core set against Magic’s very first core set. The task? A showdown between Core Set 2019 and Limited Edition Alpha-Beta. The means? Full-Set Singleton. Full-Set Singleton is a constructed format of my own creation. 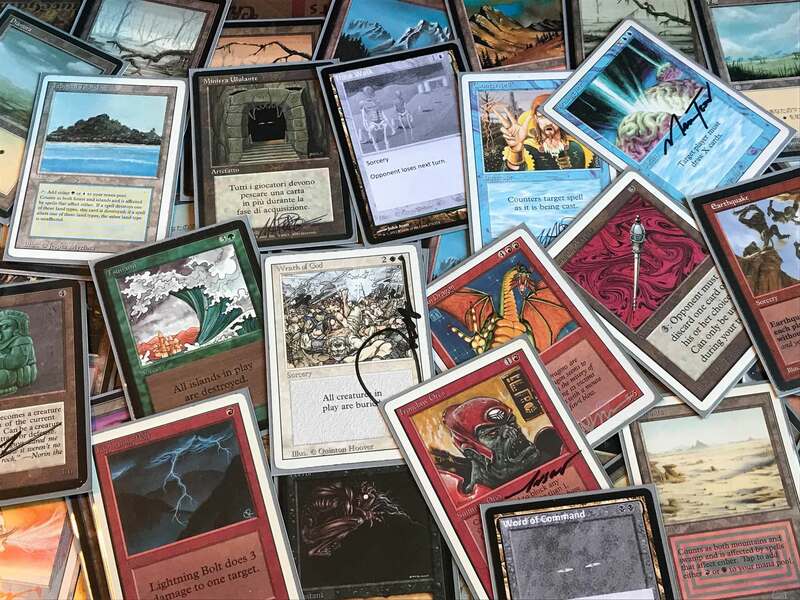 A Full-Set Singleton deck contains one each of every non-basic land card from a Magic set to which enough basic land of each basic type has been added so that the deck contains 40% land. It’s just that simple. These decks are generally very large and require a little more work to randomize than a deck with forty, sixty or one hundred cards. Building a Full-Set Singleton deck is as easy as building a set and then adding some basic land to it. Did you build a set of Core Set 2019? Cool. That set contains 294 different cards not including basic lands. Add 195 basic lands (39 of each type) to that stack and just like that, you’ve got the 489 card Core Set 2019 Full-Set Singleton deck. You like shuffling, right? It probably wasn’t too hard to build a set of M19, boxes of boosters aren’t too expensive if you want to rip packs and most of the individual rares and mythics aren’t very expensive if you have to fill in some holes to complete your set. What about Alpha-Beta? Yeah, those cards are a little harder to come by these days. My Alpha-Beta Full-Set Singleton deck contains 276 cards not including basic lands to which I added 185 basic lands (35 of each basic type) for a total of 461 cards. My Alpha-Beta FSS deck contains many actual Alpha and Beta edition cards. It also contains square-cornered collector’s edition cards, Unlimited and Revised edition cards, and even *gasp* proxies of cards I do not currently own. Building my ersatz collection of Alpha-Beta was a labor of love. I initially got this Full-Set Singleton deck together five years ago. Guess why? So I could pit Alpha-Beta against Magic 2014 to help celebrate Magic’s twentieth anniversary. Okay, so you’ve got a giant M19 deck on one side and a giant Alpha-Beta deck on the other side, what’s the point? Battling, of course. Full-Set Singleton gives Magic-lovers like you and me the unique opportunity to actually pit one set against another. The Core Set 2019 (M19) deck has all the good cards in the set as well as all the terrible ones. Everything from Abnormal Endurance to Woodland Stream. The Alpha-Beta deck contains all the solid gold hits like the hallowed Power Nine and a full set of ten original dual lands, but it also includes a lot of forgettable cards that aren’t very powerful at all. Everything from Air Elemental to Zombie Master. It’s easy to think that the current core set isn’t very powerful, or memorable, and easy to imagine that Alpha-Beta is a much better set. Full-Set Singleton gives us a way to find out the real answers together. For your for your edu-tainment, I proudly present a battle between Core Set 2019 and Limited Edition Alpha-Beta. For you stalwart chaps that have been reading my articles this summer, this is the fifth and final chapter of Five Fun Things to Do With Core Set 2019. I played a best-of-seven-games match between Magic’s original core set, Alpha-Beta, and its newest core set, M19. Naturally, because I’m a scientist, I recorded the exact play-by-play of each of these games. Wouldn’t it be fun to look at the detailed play-by-play of this match? Sadly, it is not. You have to take my word for it. I’ll save some of the detail and give you a summary of each game of this historic match. No special rules are needed for Full-Set Singleton. The shuffling may be a pain, but the rules are simple, it’s exactly like playing any other constructed format. While no special rules are necessary, I have added a significant house rule for the purpose of reducing the incredible variance inherent in FSS decks. You see, all of these decks are, by definition, five-colored decks. In my house rules, each player starts each game with two “mana tokens.” Once per turn, whenever a player could play a land, that player can choose to sacrifice one mana token to search their library for a basic land and put it directly onto the battlefield untapped. This house rule has greatly increased the enjoyment of games and reduced variance greatly. Without this house rule, many FSS games are reduced to a matter of who can match a couple of land with a creature in their hand first. Game one opens with Beta on the play with an opening hand of Red Ward, False Orders, Meekstone, Birds of Paradise, Fork, Time Vault and Jade Statue. Yeah, the Beta deck has some junk in it. It’s not all Power Nine and dual lands! Thanks to my house rule, Beta can keep this hand. Beta’s turn one mana token turns into a Forest which is used to play Birds of Paradise. Now all Beta needs is a few more lands and possibly a better threat than Jade Statue. By contrast, M19’s starting hand contains Swamp, Mountain, Star-Crowned Stag, Nexus of Fate, Strangling Spores, Root Snare and Volcanic Dragon. What’s more, M19, playing second, draws an Island to start his first turn. Beta doesn’t have a land for turn two and wants to wait before using the second mana token, plays Time Vault. Beta actually gets the first creature onto the battlefield, playing Fungusaur a turn before M19 plays Star-Crowned Stag. Beta is forced to make some interesting plays. Beta plays Sleight of Mind to essentially change a Circle of Protection: Blue into a COP: White. M19 plays Volcanic Dragon on turn six and swings in the air for four damage. Beta draws and plays Chaos Orb and succeeds in the necessary test of dexterity to destroy the Dragon. M19’s Regal Bloodlord is the main problem now for Beta. M19 cuts Beta’s legs out by using Strangling Spores targeting Birds of Paradise. M19 draws Vivien of the Arkbow (the lesser Vivien available only in one of the M19 Planeswalker decks). M19 plays Vivien and uses it to make Regal Bloodlord fight with Fungusaur. On turn twelve, M19 plays Hungering Hydra with X=10. Beta draws some nostalgic favorites like Fog and Word of Command but is almost out of life points, the score is (18-7). Meekstone keeps the Hydra from ending the game until M19 draws and plays Hieromancer’s Cage exiling Meekstone on turn nineteen. When Hungering Hydra does come rumbling into the red zone, Beta has no other play but to activate Jade Statue and block. That’s when M19 plays Nexus of Fate to ensure his victory on turn twenty-two. Core Set 2019 leads the match 1-0. Beta goes first in game two with another not particularly exciting hand including Mountain, Forest, Illusionary Mask, Earthbind, Power Leak, Hill Giant and Fear. M19’s opening hand has Plains, Forest, Swamp, Isareth the Awakener, Tormenting Voice, Mist-Cloaked Herald and Thud. After converting his first mana token into an Island, Mist-Cloaked Herald is on the job on turn one. M19 plays Isareth on turn three while Beta finally plays Hill Giant on turn four. M19 chops Magic’s original set down to size on turn seven with Mist-Cloaked Herald, Catalyst Elemental and Aerial Engineer. Core Set 2019 leads the match 2-0. Beta has its most powerful opening hand so far in game three with two Forests, Gloom, Pestilence, Resurrection, Drain Power and Sea Serpent. Lands sold separately. M19 keeps Island, Timber Gorge, Rupture Spire, Oreskos Swiftclaw, Aegis of the Heavens, Arcane Encyclopedia and Hieromancer’s Cage. M19 draws and plays Dryad Greenseeker on turn two. Dryad Greenseeker is an uncommon in M19 but probably more powerful than half of the rare creatures in Beta. Militia Bugler lands on turn three but gains M19 no free cards when he enters the battlefield. It looks like we’ve finally found a format where Bugler isn’t very good. Beta does play Pestilence on turn five but Hieromancer’s Cage solves that problem for M19. Bugler and Swiftclaw do most of the damage for M19 on the way to winning the game on turn eight. Core Set 2019 leads the match 3-0. A pattern begins to emerge when we see Beta’s opening hand for game three: Swamp, Mountain, Forest, Tropical Island, Circle of Protection: White, Crusade and Living Lands. There just aren’t enough (good) creatures in the set. M19 keeps an opening hand with Plains, Child of Night, Pendulum of Patterns, Ravenous Harpy, Liliana’s Contract, Befuddle and Demanding Dragon. M19’s curve looks like this: Child of Night on turn two followed by Ravenous Harpy on turn three. Beta has a pretty good one on turn four, Bog Wraith. Beta adds Crusade to his side a turn later and starts to feel better about the game. On turn seven, M19 plays Demanding Dragon and Beta is compelled to take five damage instead of sacrificing Bog Wraith. Beta removes the Demanding Dragon with Terror on turn eight, or rather, would have if M19 hadn’t responded to the Terror by sacrificing Demanding Dragon to Ravenous Harpy. With Kormus Bell in play, Beta swings with its best attack in four games with Bog Wraith and three Swamps. It’s no good, though, Ravenous Harpy has Beta dead on board. Beta’s last gasp effort makes the score (11-3) in favor of M19. M19 attacks with the Harpy for the win on turn ten. Core Set 2019 wins the match 4-0. As this matchup is less titanic is scope, I played a normal best-of-three-games match. In game one M14 found itself playing first with an opening hand of two Swamps, Gnawing Zombie, Master of Diversion, Time Ebb, Staff of the Death Magus and Jace, Memory Adept. Yeah, Jace was pretty broken in limited five summers ago. Too bad the libraries in Full-Set Singleton are so large. M19 keeps an opening hand for two Islands, Plains, Swamp, Rogue’s Gloves, Volcanic Dragon and Snapping Drake. M14 has the first creature on the board with Gnawing Zombie on turn two. M19’s turn two play of Rogue’s Gloves is even less threatening. M14 draws Ajani, Caller of the Pride, but has it countered by M19’s Cancel. M14 has the edge on creatures with Gnawing Zombie and Undead Minotaur and the score is (16-20) in M14’s favor at the end of turn four. M19 draws and plays Snapping Drake, M14 plays Master of Diversion on his next turn. M19 adds a defensive body to the board on turn six with Suspicious Bookcase. M14 is still winning the race at the end of turn seven (8-14). Volcanic Dragon evens things out for M19 on his turn seven, he attacks with the Dragon and Snapping Drake (8-7). M14 plays Time Ebb and chooses to target Snapping Drake instead of Volcanic Dragon because of the Dragon’s haste. M19 replays Snapping Drake, attacks with the Dragon (8-3), then plays Thud sacrificing Snapping Drake targeting M14’s face. Core Set 2019 wins game one on turn eight. M14 is on the play in game two and keeps an opening hand with Mountain, Phantom Warrior, Vial of Poison, Fleshpulper Giant, Haunted Plate Mail, Bogbrew Witch and Regathan Firecat. M19’s opening hand contains Island, Plains, Isareth the Awakener, Diamond Mare, Gravewaker, Regal Bloodlord and Thornhide Wolves. Both players are playing creatures but no damage is dealt to a player until turn seven when M14 activates Haunted Plate Mail and attacks (16-20). M19 chose not to block on turn seven with his Chromium, the Mutable. M19 attacks with Chromium on his turn seven (16-13), then plays Isareth the Awakener. M14 plays Megantic Sliver on turn eight but is officially behind in the race. At the end of M14’s eighth turn M19 activates Chaos Wand exiling twenty cards before hitting Lay of the Land. M19 attacks with Chromium again on turn eight (14-6). M14 fails to draw an answer for M19’s Elder Dragon and concedes. Core Set 2019 wins game two on turn nine and wins the match 2-0. By this point, Core Set 2019 is feeling pretty good about itself. Having defeated Limited Edition Alpha-Beta and Magic 2014, it’s looking for a bigger challenge. A few months ago, in the third annual Modern March Madness competition, Rivals of Ixalan emerged as champion in its first time in the bracket. This Full-Set Singleton competition pits all of the sets in Modern against each other in a sixty-four team single elimination bracket. In the first game of this best-of-three-games exhibition, M19 rejects an opening hand with three Mountains, Forest, Skilled Animator, Mind Rot and Omniscience. M19 feels slightly better about a six card hand with Plains, Island, Forest, Swamp, Sovereign’s Bite and Militia Bugler. M19 scrys Island to the bottom of their library. Rivals of Ixalan keeps an opening hand with three Mountains, Plains, island, Woodland Stream and Azor, the Lawbringer. A six-lander is not generally a good hand in Full-Set Singleton but Azor, the Lawbringer makes it worth the gamble. M19 hits the scoreboard first on turn two with a card nobody cares about, Sovereign’s Bite (23-17). Militia Bugler arrives on turn three but only moves Vivien of the Arkbow and three lands to the bottom of M19’s library (in a random order). While Rivals continues to play land-go, M19 attacks with Bugler on turn four and plays Liliana, Untouched by Death, adding a counter to Liliana milling Sparktongue Dragon and Swamp and Ghostform into his own graveyard from the top of his library. On turn five, Bugler attacks and Rivals eliminates it with Reaver Ambush. M19 plays Skyscanner on turn six drawing Sarkhan, Fireblood. On turn six Rivals of Ixalan lands Azor, the Lawbringer. Azor attacks on turn seven and Rivals activates Azor’s ability with X=4 drawing four cards and gaining four life. M19 needs an answer and soon. M19 finds chump blockers but not much else. Rivals adds a counter to Azor with Hunt the Weak and eliminates Aerial Engineer at the same time. Rivals attacks with Azor and activates his ability with X=6 on turn ten to drop M19 to six life while drawing Rekindling Phoenix and Tetzimoc, Primal Death and four other cards. Rivals of Ixalan wins the game on turn eleven and leads the match 1-0. M19 plays first in game two with an opening hand containing Elvish Rejuvenator, Uncomfortable Chill, Ajani’s Last Stand, Meteor Golem, Vampire Neonate, Satyr Enchanter and Nicol Bolas, the Ravager. Rivals keeps Mountain, Swamp, Forest, Island, Hornswaggle, Enter the Unknown and Waterknot. M19’s turn one Vampire Neonate starts nibbling at Rivals’ life total on turn two (21-19). M19 plays Elvish Rejuvenator on turn three and accelerates a fourth land onto the battlefield, a Plains. This game slows down to a crawl after Waterknot ties up the Neonate. Rivals has a Vampire token with lifelink that is gaining +1/+1 counters from Hadana’s Climb. Unfortunately, M19 plays Luminous Bonds to lock down the growing Vampire token. Hadana’s Climb transforms into Winged Temple of Orazca but Rivals doesn’t have any creatures to use it on. M19 is starting to get ahead on cards with Arcane Encyclopedia but doesn’t yet have the mana to play Nicol Bolas. At long last, M19 breaks the stalemate on turn eleven when Nicol Bolas, the Ravager arrives on the battlefield. As big a stick as Nicol Bolas can be, the real problem is simply a lack of creatures for Rivals. Core Set 2019 wins game two on turn thirteen and ties the match 1-1. In game three Rivals plays first keeping an opening hand with Swamp, Plains, Snubhorn Sentry, Thunderherd Migration, Jungleborn Pioneer, Swift Warden and Curious Obsession. M19’s opening hand contains Plains, Mountain, Patient Rebuilding, Nexus of Fate, Suspicious Bookcase, Shield Mare and Goreclaw, Terror of Qal Sisma. The first creature played is Suspicious Bookcase on turn two. Rivals plays Skymarcher Aspirant on turn two. On turn four Rivals plays Siegehorn Ceratops. Then he plays Plains and Snubhorn Sentry. Rivals of Ixalan gains the City’s Blessing. He plays Curious Obsession enchanting Skymarcher Aspirant. The Aspirant flies over for three damage (17-20) drawing a Swamp. M19 plays Waterknot enchanting the Aspirant on turn five, at the end of the turn Rivals unties the Waterknot with Cleansing Ray. Rivals of Ixalan overruns M19 with Skymarcher Aspirant, Siegehorn Ceratops, Jungleborn Pioneer and a Merfolk token and Snubhorn Sentry. Rivals of Ixalan wins game two on turn seven and wins the match 2-1. Next March, while the college kids are running back and forth with basketballs, you and me will be pondering the matchups in the Modern March Madness 2019 bracket. As of March, there will be an astounding sixty-two sets legal for Modern. Only Return to Ravnica and Dragons of Tarkir, each one-seeds, will have a first round bye in the tournament. The four sets that will be new to the tournament, Dominaria, Core Set 2019, Guilds of Ravnica and Ravnica Allegiance, will start with low seeds in their first bracket appearance. Will Core Set 2019 perform as well as it did against Magic 2014 and Rivals of Ixalan? We won’t know until the madness begins next March. In the meantime, keep a warm thought in your heart for Full-Set Singleton, Magic’s only scientific method for battling entire sets of cards against each other.